Lennon Parham stars in the new USA comedy, “Playing House.” The actress plays the character of Maggie Caruso, a woman who had everything going for her, only for it to turn upside down when she finds out that her husband has been having an online affair with another. Now, eight months pregnant, she enlists the help of her childhood friend, Emma Crawford (Jessica St. Clair) throughout her pregnancy. NaVell J. Lee: Hi, Lennon. How are you? Lennon Parham: Hi! I’m good. How are you? NJL: Doing well. Thanks for taking time out to speak with me this morning. LP: Oh, it’s great to be here. NJL: I just spoke with your co-star and “friend-sian,” Jessica St. Clair, a few moments ago. LP: Oh, great! You got a double dose. Let’s see if our stories match up. LP: Yea, that’s right. It’s not a nice thing to find out when you’re 8½ months pregnant, and to find it out DURING the baby shower. No, thank you. NJL: Wait, she found this out during her baby shower? I didn’t know that part! LP: Well, her good friend, Emma, made a baby slideshow featuring Maggie and her husband when they were babies, as well as photos of her parents. Right in the middle of that, the Apple TV switches wires and her husband’s live web chat smashes up on the screen. The whole baby shower saw it, and it’s pretty embarrassing. NJL: Good heavens! That is definitely not something a wife needs to find out about, especially during a baby shower. LP: Not at all. Good thing Emma is there to help Maggie deal with it all, right? NJL: Of course! What’s interesting, too, is that during the filming of the pilot, St. Clair mentioned that she was also three months pregnant. LP: Yes, that’s right. And I was not so secretly 8½ months pregnant. (laughs) It was a real situation on set with both of us pregnant, as you can imagine. She kept asking me to order extra steaks for her, and I felt like some sort of diva having to order multiple steaks multiple times a day. NJL: That’s not diva mode! That’s me on a good day when I order multiple steaks. LP: Oh, it’s not diva mode? What about if I asked for a silk sheet to be draped down on the chair before I sat down? NJL: Now, that may be taking it one step too far. NJL: How is Maggie’s character? Emma seems more no-holds barred, and gets what she wants. Maggie is more relaxed and laid-back. Is there going to be any change to her character, now that she is rid of her husband, now with her best friend helping with this child, how will this change her? LP: I think we make different choices at different parts in our lives. When Maggie needed some safety and stability in her life, she made that choice to marry this man who was good for her at the time. Now, he isn’t as much. With Emma being back, it is going to push Maggie to find out what she wants in life and take risks. When you have your ways set in the middle of your life, and things get upended, it’s scary. You don’t know which way is up. You need your best friend there by your side to help you be strong to make those strong choices. NJL: It’s going to be interesting, not just for Maggie, but for Emma as well. LP: Exactly. Emma is back in town, and now has to face her demons. She left town and got out of dodge. She was proposed by her former high school love, played by the phenomenal Keegan-Michael Key, and left him and hit the road. She didn’t even say goodbye. Now, she’s back and has to face him, and her estranged mother, played by Jane Kaczmarek. NJL: When I saw that Kaczmarek was playing St. Clair’s on-screen mother, I was very excited to see this. LP: Let me tell you what. When we began writing the show, we write it in a way where we improvise. We would then act out the scenes that Jane would eventually get to say. It was such a satisfying feeling hearing Jane Kaczmarek saying words that you’ve written, and making it funnier than you could imagine. It was really amazing for a creator and executive producer of a show. NJL: Was there any other choice for this part? LP: No, she was the perfect casting for the role. She and Jessica are definitely cut from the same cloth. When Jane came in for her fitting, we went in to meet her and said, “Hi.” Jane and Jessica totally went on this tear. They both have dimples on one side of their cheek, and it was literally like a mother-daughter moment. I went, “Oh, my gosh, what’s happening?! This is amazing!” We both got lectured immediately, and Jessica and I looked at each other and went, “Oh, she’s perfect.” On top of all that, she is NICEST person in the whole world. She sends us e-mails all the time about how great us working moms are creating and starring in our own shows. It’s been really amazing to have that support from her. NJL: You and St. Clair actually worked together for the former series, “Best Friends Forever.” How did you both come together to pen this and get this for television? LP: We wanted to tell this story about where we were in our lives at the time. Both of us had babies on the brain, and we weren’t pregnant at the time. So, we were thinking about another easier way to get into some great hijinks. Jessica said, “This may sound crazy, but what if we raised a baby together?” I said, “That’s not crazy. That’s the best idea you’ve ever had.” Minutes later, we had all of these ideas covered on paper. We hit on our idea head on. NJL: I think it is hilarious to hear the story about how while none of you were pregnant yet, you had this idea and ran with it. And now you both ARE. LP: Jessica will tell you this story, too, but I was exactly where I needed to be while pregnant when we shot the pilot. It generally doesn’t happen like that. We started shooting that Monday, and I turned 32 weeks pregnant. On the show, I say I am eight months pregnant. It worked out perfectly, but my husband will say that he had something to do with it. (laughs) Just remember, I was really pregnant when she was throwing me around like a rag doll and shoving me in a playhouse. NJL: Isn’t that when you have a stunt person doing that stuff? LP: No way. We do our own stunts, just like Angelina Jolie. NJL: Hey, if you can do that, the more power to you! LP: I think Angelina Jolie probably orders multiple steaks a day, right? NJL: If she can do it, so can you! NJL: The series premiere of “Playing House” airs tonight, April 29, at 10/9c with two back-to-back episodes, and regularly air at 10 PM every Tuesday. Do you happen to have your own Twitter handle? 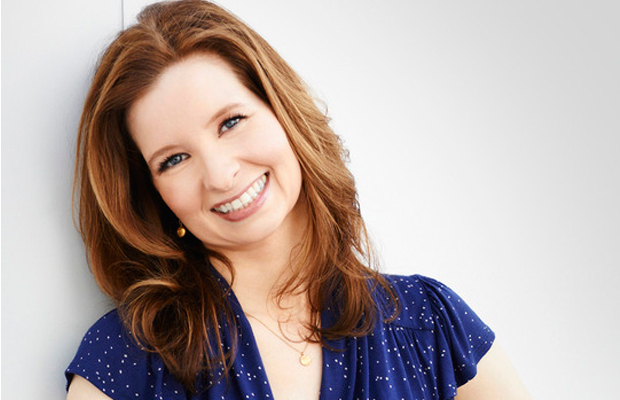 LP: Yes, it is just my name, @LennonParham, and you can also follow the official show Twitter @PlayingHouseUSA. NJL: We look forward to watching. Thank you so much for speaking with me. Absolute pleasure. LP: Thanks so much! Pleasure. Watch “Playing House” Tuesday nights at 10/9c on USA.